Jeffk 1970 wrote: By August of 1943 military reverses caused the Germans to begin evacuations. The camps were liquidated and a few survivors sent west. The author estimates that about 25,000 Jewish workers worked and died along the DG IV corridor. . . .
Again, no help for either a "transit" theory trying to make the death camps benign stopovers or for the claim that millions of Jews were into little-known camps which were then overrun by the Soviets, thus absorbing millions of Jews into the USSR after the war. The events in the camps - including high mortality, and the westward evacuations of surviving prisoners are directly counter to what deniers try to pass off. The author estimates that about 25,000 Jewish workers worked and died along the DG IV corridor. . .
We all know the counter claims, which you in your lack of wisdom keep on expressing. The author estimates: can you or anyone else verify the authenticity of this author. Apparently neither is broadly read enough even in online revisionist thought to recall the Millsian White Sea Gambit. Well, tonight we helped folks learn what Butz said about Auschwitz, so all's good. As to the 10s of 1000s of Jews in the Brest-Litovsk area that some deniers claim would have fallen into Soviet hands when the USSR reoccupied the region, on the eve of the region's liberation by the Red Army Gebeitskommissar Franz Burat wrote in his situation report for January-March 1944, dated 21 March 1944, "There are no more Jews in the district . . ."
The investigative journalist-lawyer Arkady Vaksberg reveals the genesis and evolution of the Communist leader's malevolent campaign ...the plan to deport the entire Soviet Jewish population to Siberia. Following the Soviet invasion of Poland, Stalin began a policy of relocating Jews to the Jewish Autonomous Oblast and other parts of Siberia. Throughout the war, similar movements were executed in regions considered vulnerable to Nazi invasion with the various target ethnic groups of the Nazi genocide. When these populations reached their destinations, work was oftentimes arduous and they were subjected to poor conditions due to lack of resources caused by the war effort. I actually peeked at VFX’s post. Stalin became much more antisemitic after the war so WTF that has to do with anything, I don’t know. Stalin did deport ethnic minorities during the war but targeted regions and minorities that he suspected were traitorous. Jews were evacuated during the German invasion but in their capacity as Communist Party members, factory managers, engineers, etc. This evacuation included non-Jews, of course. Jews also fled in large numbers. Jeffk 1970 wrote: I actually peeked at VFX’s post. Stalin became much more antisemitic after the war so WTF that has to do with anything, I don’t know. Stalin did deport ethnic minorities during the war but targeted regions and minorities that he suspected were traitorous. Jews were evacuated during the German invasion but in their capacity as Communist Party members, factory managers, engineers, etc. This evacuation included non-Jews, of course. Jews also fled in large numbers. After the war indeed. Anything you have been told by the Soviet administration is pure propaganda most likely. They are much more culpible than you care to realize in Jewish atrocities. I didn't peek. Has he gotten around to providing evidence for what he says - or is he still handwaving the evidence away with assumptive nonsense about Stalin and total ignorance about how historians have reached conclusions about this? Anyway, as to Stalin's population expulsions, one aspect of the crimes the Soviets committed at the end of the war and after the war against especally Crimean Tatars and Ukrainians had to do with perceived and real collaboration of individuals among these groups in Nazi genocide (as well as in other ways - “assistance to the fascist invader”). The Stalinist resort to collective punishment (ethnic cleansing, widespread executions), based on nationality, rather than on individual culpability proven with evidence, was, by 1945, much in line with Nazi practices. His post was irrelevant to his liberation/assimilation "theory". No and I won’t hold my breath. Statistical Mechanic wrote: As to the 10s of 1000s of Jews in the Brest-Litovsk area that some deniers claim would have fallen into Soviet hands when the USSR reoccupied the region, on the eve of the region's liberation by the Red Army Gebeitskommissar Franz Burat wrote in his situation report for January-March 1944, dated 21 March 1944, "There are no more Jews in the district . . ."
This region is an interesting case study. In summer 1941 about 15% of the region's population (including 1000s of Jews) was murdered by German units (Police Battalion 307 assisted in "special tasks" by the Wehrmacht Infantry Division 162) (some of the murders are recorded in EM 32). Then, for a little over a year, the situation stabilized - with the institution of a harsh regime for surviving Jews, not quite half of whom were put to work on German projects. In mid-October 1942, however, the Jews who'd survived since the summer 1941 were nearly all put to death, including those working on German projects. The 13-month stable period extending from summer 1941 until October 1942 came about through the intercessions of Gebietskommissar Burat who established, in cooperation with the local SS leadership, "a large workshop complex for the employment of Jewish skilled workers on the model of the Lublin workshops," according to a 1942 document of the local SS und Polizeistandortführer. Burat during this period noted that the Jews in Brest became more and more nervous as they learned of the mass murders underway in Lublin district, saw the Jews as good workers - perhaps encouraged by fear for their own lives, and, despite growing and critical food shortages, did not deport non-working Jews from the area for execution in the Lublin program. Local officials had differing views on the last point. The actions are to be accelerated, so that they are completed in your area within five weeks. At the meeting of Gebeitskommisaren in Luzk from August 29-31, 1942, it was explained in general that in principle a 100% solution is to be carried out. . . . This 100% cleansing is also the emphatic personal wish of the Reichskommissar [Koch]. The new instructions permitted retention of highly skilled Jew workers only in very small numbers and for a maximum two month transition period. Local Security police, Gendarmerie, and Schutzmannschaften thereafter carried out murder actions killing all but about 300 Jews, now held in two camps, in the towns around Brest. Local German officials in Brest made appeals that the working Jews in the city be spared on account of labor shortages and the economic paralysis that would result from "the cleaning up of the Jewish question." Burat advocated for sparing the lives of only the working Jews. A force of over 1000, composed of men from Police Battalion 310, a company of police reservists, the 48th motorized police company, local gendarmes, local Schutzmannschaften, and Brest Schupos and Sipos surrounded the Brest ghetto on 15-16 October 1942. The Jews were rounded up. Those found to be infirm were shot on the spot. The majority of the Brest Jews, however, were taken by train to Brona-Gora, about 60-65 miles from Brest where pits had been dug in advance and the Jews were shot. "Jew hunts" continued in the ghetto to make sure all the Jews were found and executed. At the end of the action about 20,000 Jews had been murdered - of them about 9000 had been employed and of these about 2000 had been deemed highly skilled and irreplaceable. In Brest a local initiative to keep Jews alive for labor realized its goals for over a year – until fall 1942 when the imperative of cleansing the region of Jews led to the mass murder of all the Jews who had been kept alive temporarily. The economic needs, championed by local officials, were overridden at that time and the Jews were eliminated entirely from the district mostly in mass shootings. Last edited by Statistical Mechanic on Sun Sep 30, 2018 3:25 am, edited 2 times in total. Ironically I just got through that portion of Cesarani’s book. 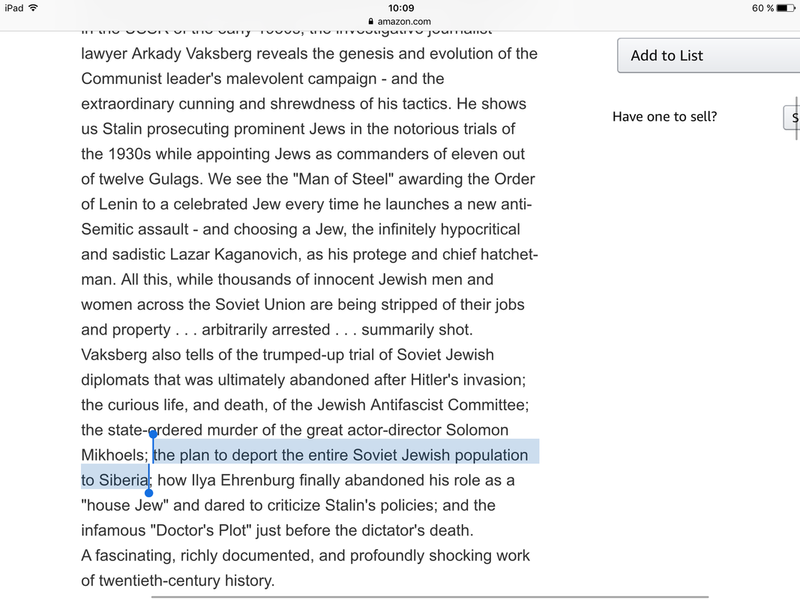 So, a Soviet era journalist (I thought they could not be trusted) has written that the Soviets moved the Jewish population away from the Nazi advances east, as part of a plan that had begun in the 1930s, to deport the Jews to Siberia. The deniers are still showing that they do not understand the chronology and geography of WWII and that it is the disappearance of the Jews who were only ever under Nazi control that is the issue. Those Jews did not disappear due to the Soviets, because they were never under Soviet control. In fairness to our denier friends, they are certainly unaware of this body of research, so discussing it or saying anything informed about the issues is simply beyond their reach. We're outnumbered by the common variety of garden slug, but we'll never be outclassed. Let them spew their personal attacks which go ignored. It's to their discredit. It's all about their insecurity over not having evidence that dates back to the 40's which can be relied upon without causing them embarrassment over the simpletons who made it up and shewed it. Much better than the online BS generators some members are using. scrmbldggs wrote: Much better than the online BS generators some members are using. Eggs, are you tired of being ingored like a pimple on a hog's south end? If so then I'm ready to give you another chance. If you act in the same belligerent way then you can stew in your own juices for another month of two. And don't fret about me being the skeptic anymore. I'll be one of the deniers to make you happy, even though I'm going to consider myself a skeptic. That isn't going to change eggs. That guy is a total hoot at the pretending not to be a denier routine, he just cannot help himself. ummm, Have you met Fredrich Berg? have you? from another, now-locked thread but pertinent here: As to evidence from the USSR about the fate of Jews in the country, I read an interesting paper today on a large collection of source material about the executions of Jews and other civilians carried out by the Germans in the occupied East. This collection is from the Main Political Administration of the Red Army held in the Central Archives of the Ministry of Defense of the Russian Federation (TsAMO RF). It includes over 4000 pages of German documents, testimonies of captured Germans and Romanians, reports by Red Army departments, letters and diaries of residents, observer and bystander interviews, testimonies of escaped Soviet POWs, photographs taken by German personnel, etc. These documents had their "confidential" classification removed only in 2010-2011.